Renovating a home can be thrilling both in the positive and the negative sense. Positive in that it gives you the opportunity to finally add all the features you’ve always wanted in your home, but negative in that you could do some real design damage if you don’t know what you are doing. Add a coffee bar by the master bedroom, absolutely! His and her toilets, yes! Accordion style doors across your charming bungalow…maybe not. Every home has a style and it is a firm belief of mine that you should read the traits that already exist in your home and use them as a compass when you are selecting new layouts of rooms and design features for your home renovation. To use my example of accordion style doors across a charming bungalow, would this work great, maybe, but would it look great, probably not. The expanse of glass across the entire rear of a cottage style home just looks too new. It reads as an addition or change, which brings a sense of inauthenticity to the home. When designing a renovation, I always try to make the house better than it was, while still keeping the style and character intact. I want the changes to not look like changes at all, rather to appear as if the house was always this way. 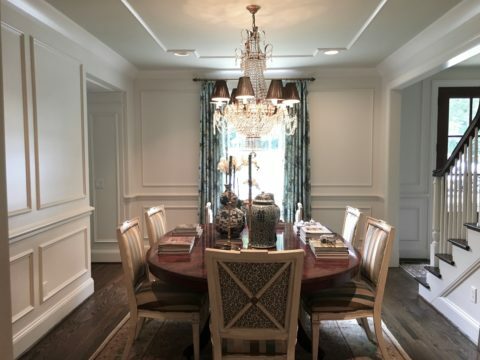 While completing the renovation to this dining room, we added molding that matched the original living room trim and in keeping with the 1930s style of architecture. So what should you do when considering a renovation? Here are my top 3 tips that can make your house renovation look like a polished jewel in the neighborhood. Determine the style of the home. Read the clues that already exist. 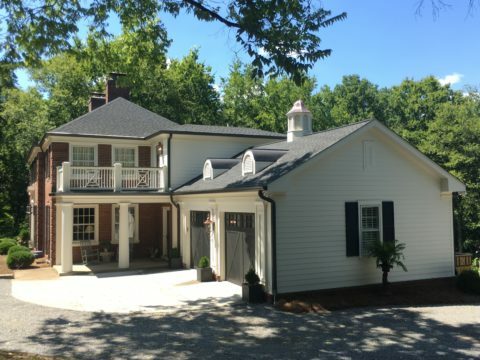 Is the house a Cape Cod cottage or a Georgian manse? Is it Mid-Century modern or Prairie Style architecture. Figuring out the main style of the home will help you to make the right selections for lighting, trim and plumbing fixtures. Research the style on Pinterest and see what other people have done in their own renovations for similar architectural styles. 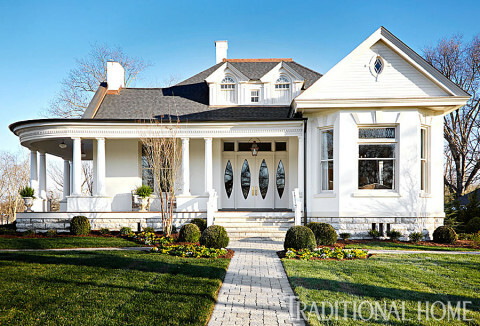 This lovely victorian was brought back to its original grandeur by keeping the original doors and adding back the trim and molding detail around the front porch. Look at the roof line. Is it a gable or hip style? 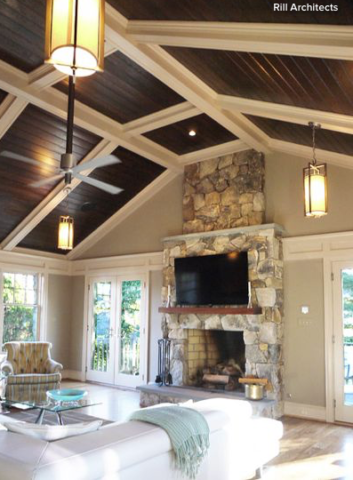 Repeat the roof line style on the addition so that it feels cohesive. If there is molding at the cornice, repeat the same molding on the addition. Repetition is an easy way to unify old and new spaces keeping additions or modifications to existing structures flawless. This is the largest mistake novice home remodelers can make on a renovation and I’ve seen it more often than not. They blow out the back of a house and add on a two-story addition. The front of the house is a modest cottage, but upon entering you see exposed rafters and a huge opening exposing a two-story great room in the rear. This is so confusing visually and spacially. This is the garage and bathroom addition to our home, Boxwood Hill. We matched the trim from the original part of the home and set the addition back and made it smaller in scale than the main body of the house. If you are building an addition, be sensitive to how the room would have been built originally. For our daughter’s bathroom and closet addition, we made the bathroom two small rooms, one for sink and one for toilet and tub. Then we added a third small room for the walk-in closet. This series of small rooms is exactly how the bathroom would have been built in 1937 when the original house was built. The addition is seamless and people do not realize it is new. That is the result you want. 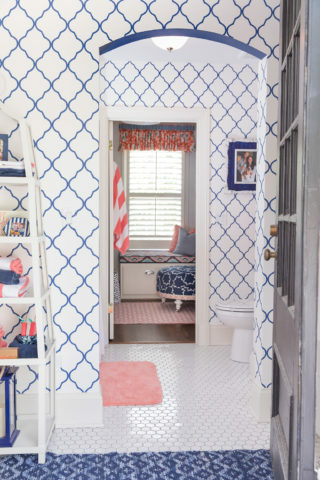 The three small “rooms” of our daughter’s bathroom create architectural character for this new addition that is in keeping with a 1937 home. Renovations can be fraught with unknown outcomes. By using these tried and true tips you will have a flawless and beautiful renovation for your family and friends to enjoy for years to come.